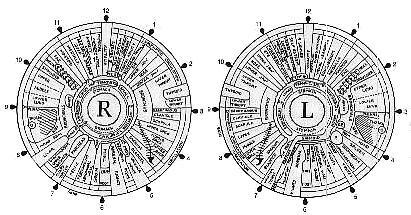 Iridology is a quick, accurate and painless system of health analysis through the examination of the colored part of the eye known as the iris. Proclaimed throughout the ages as "windows of the soul", the eyes are now acknowledged as mirrors of the body and compared to miniature television screens recording the condition of the various organs and tissues throughout the body. The iris is an extension of the brain endowed with many thousands of nerve endings, microscopic blood vessels, as well as muscle and connective tissue. Every organ is connected to the iris via the nervous system and the nerve fibres receiving their impulses through the optic nerve, optic thalami, and the spinal cord. Reference to the eye's value in health assessment can be traced back to numerous ancient scriptures and stone slabs found in Asia Minor depicting the body and eye connection. 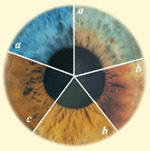 Clinical Iridology, however, began in the late nineteenth century with the Hungarian Doctor - Ignatz von Peczely. As a young child, von Peczely was trying to free an owl trapped in a vine in the garden and accidentally broke the owl’s leg. During the struggle, the two glared into each other’s eyes and he noticed a black streak instantaneously appear at 6 o’clock in the owl’s iris. He nursed the owl back to health and observed that the streak had changed over time to a crooked white line. When von Peczely became a doctor, he remembered this incident while examining a patient with a broken leg. To his amazement, Dr. von Peczely saw the same crooked white line at 6 o’clock in this patient’s iris (which he then realized was an indication of scar tissue in the leg). 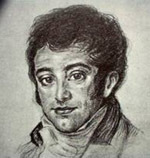 After that, he began to examine all of his patients’ irises and found correlations between the markings in their irises and their health conditions. Based on those findings he designed the very first iris chart. 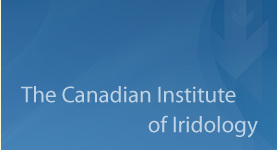 How Can Iridology Help You? The greatest advantage of iridology over other forms of health screening is that changes appear in the iris before the physical symptoms actually develops. Therefore, preventive action may be taken to improve health and avoid those diseases which might otherwise follow. Iridology does NOT reveal specific pathology (medical diseases) because many diseases create similar changes in the body tissues; rather it reflects hereditary tendencies and the condition of the tissues (i.e. inflammation, acidity, toxicity, congested lymph, and hardening of the arteries). Iridology is therefore not concerned with specific symptoms, but with the restoration and maintenance of health by building up the body's immunity and healing ability.